At the end of last month (on 28th August) I sat on a hillside in Galicia, Spain, next to a beautiful bush of flowering bell heather, photographing the wasps which were gorging themselves on the pollen and nectar. They were covered in pollen (below). They were very calm and non-aggressive and I sat right next to them for some time. I did not realise at they time that I was photographing the Asian hornet or yellow-legged hornet (Vespa velutina), and not a native species. 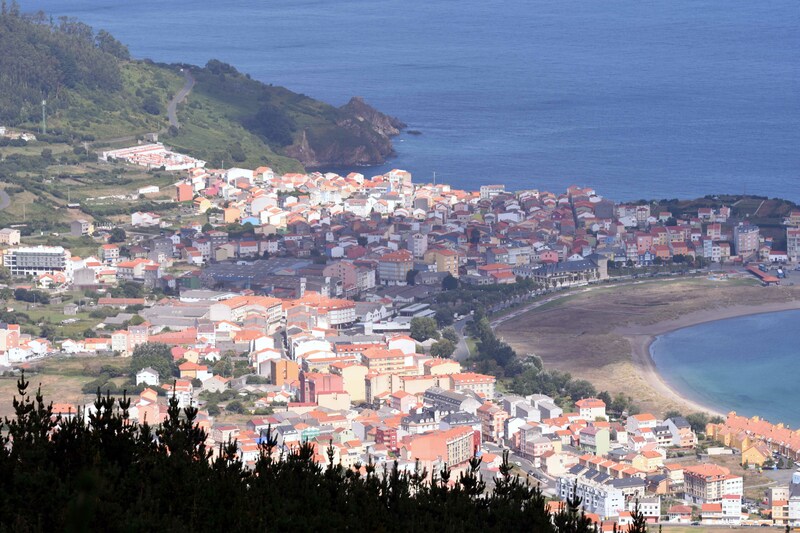 The site was near a beautiful lookout point called Mirador do Miranda en Cariño above the town of Cariño (below). 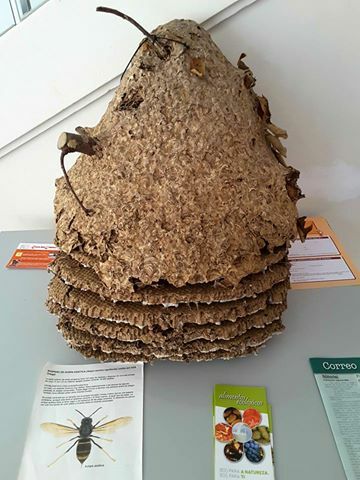 It was only when I saw the impressive nest of this invasive species in the local museum in Ortigueira, did I realise that I had been watching the Asian hornet. This insect was first detected in Galicia in 2013 and appears to have significantly spread and colonized new areas in the past few years. It is reassuring to see that much is being done to try to minimize the impact of this pest and there is some excellent information available online (in Spanish) including a pest management programme. (5) The widespread presence of the Asian hornet in this area is however, very worrying. It seems that the pest is now very well established in northern Spain and is surely impossible to eradicate. 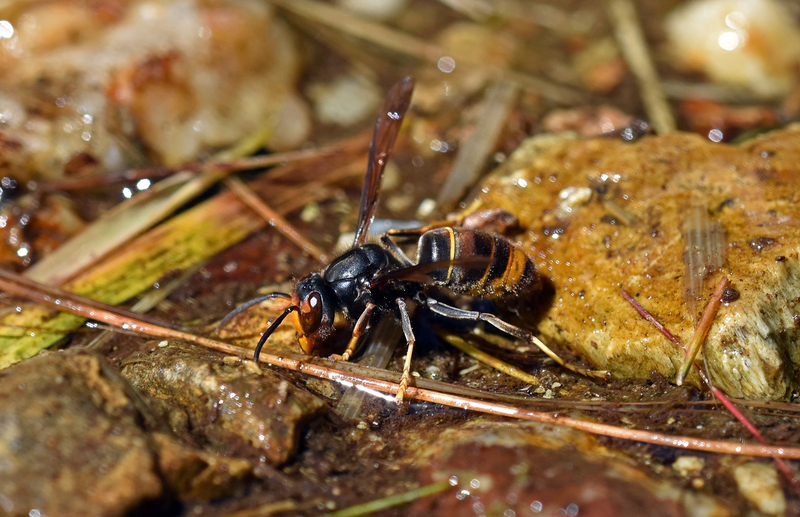 In South Korea, where V. velutina also invaded and is now well established, it has rapidly displaced native hornets and become the dominant species in urban areas. (6). 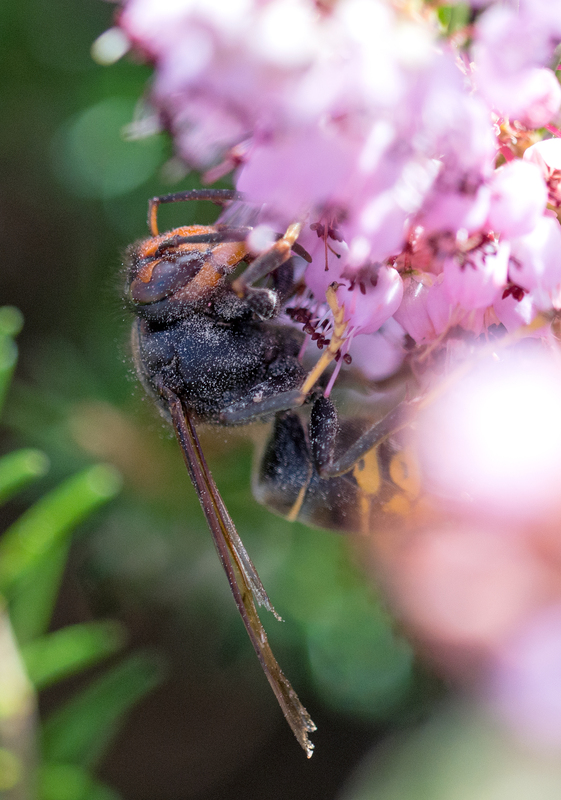 That is a very worrying prospect for European countries and a lot of work needs to be done, especially on the ecological effects on native species, as this Asian hornet feeds very wide range of insects, including flies, dragonflies and grasshoppers. 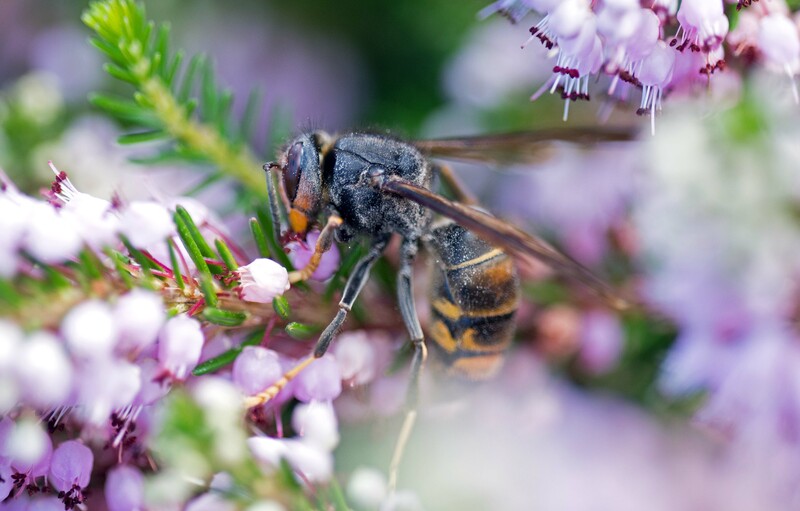 It is really quite concerning, not just for honey bees, whose hives can be protected – by reducing the hive entrance to a narrow slit – to keep out the invasive hornet, but for native insect species. There are some fantastic pictures of Asian hornets attacking a bee hive on this site called The Bee photographer (7). Monceau, K., Bonnard, O., & Thiéry, D. (2014). 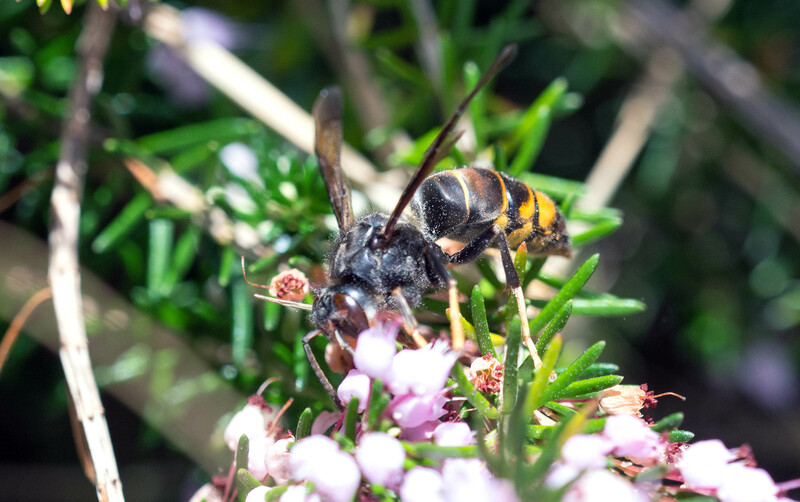 Vespa velutina: a new invasive predator of honeybees in Europe. Journal of pest science, 87(1), 1-16. Tan, K., Radloff, S. E., Li, J. J., Hepburn, H. R., Yang, M. X., Zhang, L. J., & Neumann, P. (2007). Bee-hawking by the wasp, Vespa velutina, on the honeybees Apis cerana and A. mellifera. Naturwissenschaften, 94(6), 469-472. Tan, K., Wang, Z., Li, H., Yang, S., Hu, Z., Kastberger, G., & Oldroyd, B. P. (2012). An ‘I see you’prey–predator signal between the Asian honeybee, Apis cerana, and the hornet, Vespa velutina. Animal Behaviour, 83(4), 879-882. Choi, M. B., Martin, S. J., & Lee, J. W. (2012). 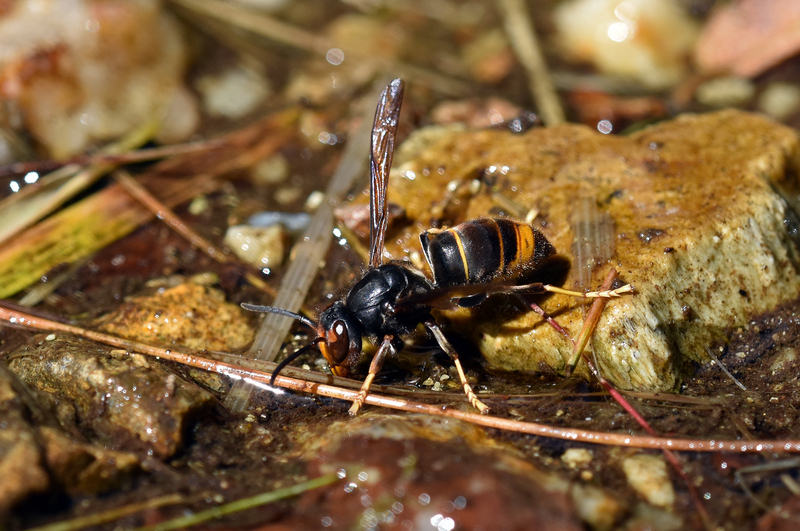 Distribution, spread, and impact of the invasive hornet Vespa velutina in South Korea. Journal of Asia-Pacific Entomology, 15(3), 473-477. Next Next post: Watch out little butterfly! Thank you for writing this, I learned a lot, it was so interesting to read about these insects. Great photos! Hi Ray, great information. I’m a Permaculture gardener in Fisterra, Galicia. I’m building a garden at the moment for a pilgrim community. In the past few weeks my garden has been overwhelmed with the little jaspers. I know that they whilst selecting a suitable nest up high they will find a place low, usually in a river bank or brush, untill the nest up above is formed. I have just been cutting back the brush furiously, which now sits on top of a river bank. Is it safe to go and investigate? They are there every morning in swarms but quieten down by afternoon but are always present. Should I just go directly to the council? Thanks for your help already. 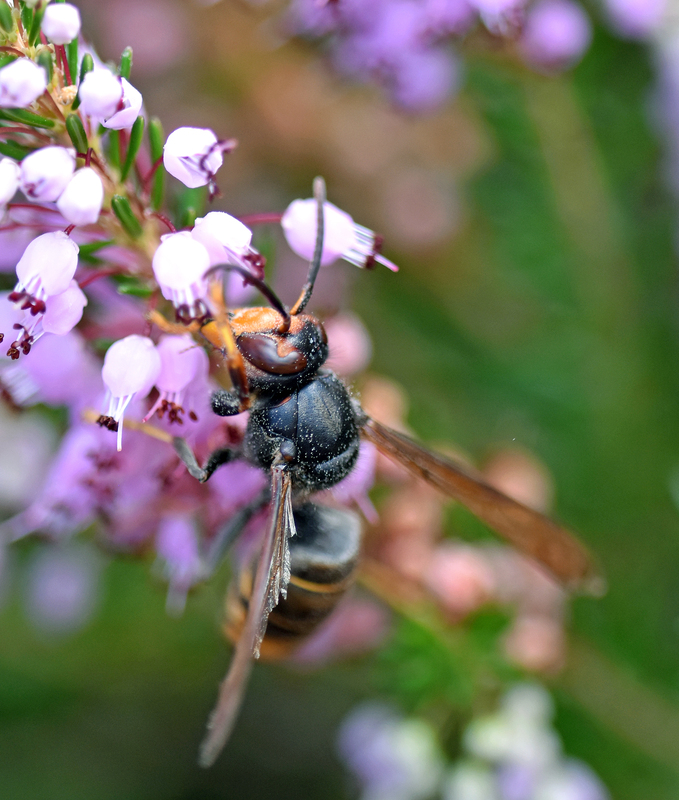 The advice seems to be, to contact the council if you spot a nest of the Asian hornet. But please bear in mind I don’t live there in Galicia, just visit for holidays. The Asian hornets are not usually aggressive, but if there are swarms of them, rather than the odd one or two, I would approach with caution! Having said that, they are not supposed yo be any worse than European hornets in terms of their behaviour. The real threat they pose is to bees, rather than people. Best to speak to someone locally however, to find how other gardeners are coping in the area. We have just captured a huge nest today, is in a plastic bag for 10 days with insecticide. We would like to preserve it to show in schools… What is the best way, to prevent stench from decomposing larvae? Apologies, but I do not have any experience of dealing with the nests. But I understand that the immature stages can be killed by freezing.